German and German PLC is a husband and wife law firm that was established in November 1991 with a vision of being a full-service law practice that could meet all of its client’s legal needs. However, after several years of practice, Rob and Melissa quickly realized that the practice of law had become too specialized for two lawyers to handle all their clients’ legal needs. Fortunately, German and German PLC, established strong working relationships with other lawyers and other law firms who could handle those specialized legal matters that German and German, PLC could not. Since 1991 Rob and Melissa have carved out their individual areas of the law which they concentrate and enjoy practicing within. Melissa concentrates her practice in the areas of: Real Estate | Business Law and Consulting | Estate Planning. Rob focuses his practice to criminal defense and domestic relations (divorce, custody and related areas). He specializes in drunk driving defense. He handles all types of criminal defense matters in both state and federal courts. Like in larger law firms, sometimes the individual lawyer’s practices overlap. 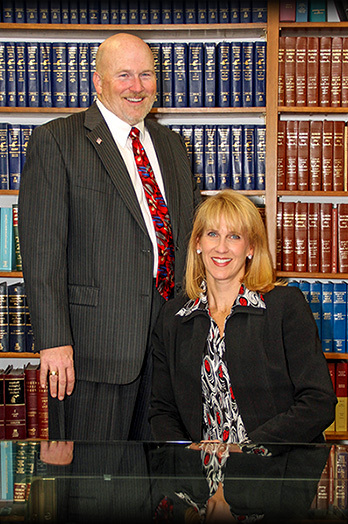 Rob and Melissa work well together on the cases that call for each of their individual areas of expertise. Rob provides litigation support on Melissa’s cases that require court attention. Likewise, Melissa lends her business and real estate expertise in those divorce cases which require such attention. German and German PLC is a husband and wife law firm that was established in November 1991 with a vision of being a full service law practice that could meet all of its client’s legal needs. "Providing experienced and effective representation focused on client-centered goals"